All applications have been reviewed and the selected school of 2019 is Little Creek Elementary School in Norfolk! The makeover weekend will take place August 9 – 11, 2019 and enhanced programming will commence with the school year this autumn. Thank you to all the school administrators who submitted applications and demonstrated a commitment to their students, staff, and communities. 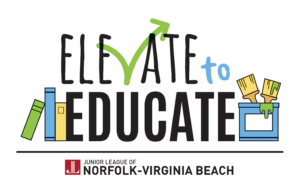 The Junior League of Norfolk-Virginia Beach is excited to announce its newest signature event, Elevate to Educate! Inspired by last year’s Project Makeover Hampton Roads, Elevate to Educate is a community initiative designed to improve the learning environment for elementary students in Hampton Roads. We believe that by elevating schools in need, we can create a lasting impact for students, staff, and surrounding communities. Each year, one elementary school in South Hampton Roads will be adopted as our Elevate to Educate school of the year. This involves two years of programming, beginning with a complete school makeover. Throughout the spring, JLNVB will work closely with school leadership to craft a makeover plan unique to the adopted school. This plan will be brought to life over just one weekend in late July-August. JLNVB, along with the help of over 100 volunteers across the Hampton Roads community, will elevate the school through landscaping, painting interactive and educational murals throughout school common spaces, and revitalizing the school playgrounds. Following the school makeover, JLNVB will engage with school administration and staff to develop meaningful programming and host special events focused on promoting JLNVB’s signature issues of childhood literacy and women’s health. To be considered for Elevate to Educate a school must be a Title 1 elementary school in South Hampton Roads. The school principal must sign and submit the application to elevatetoeducate@gmail.com by 5 p.m. on Friday, March 8, 2019. Once a school is selected, all applicants will be notified of the decision by Friday, March 15, 2019.